The Lawrence Academy of Music’s Girl Choir program celebrates its 25th anniversary Saturday, March 19 with a pair of performances in the Lawrence Memorial Chapel at 2 p.m. and 7 p.m. The Lawrence Academy of Music Girl Choir program celebrates its 25th anniversary in song March 19. The Academy Girl Choir program comprises seven choirs, with singers in grades 3-12 from the greater Fox Valley region. The anniversary concert also features a choir of 101 Girl Choir alumnae visiting from 13 states. Tickets, at $12 for adults, $8 for seniors and students, are available at the Lawrence Box Office, 920-832-6749, or online. The anniversary concerts feature some of the Girl Choir singers’ most beloved repertoire from its 25-year history, including art songs, folk songs from around the world and contemporary compositions, including one written specifically for the Girl Choir. The concert will close with the Martin Sirvatka arrangement of Walter Hawkins’ “I’m Goin’ Up A Yonder,” conducted by teacher-conductor, Cheryl Meyer, who has been with the program for 24 of its 25 years. From California to Massachusetts, Minnesota to Texas, former members will return to Appleton to celebrate the program’s silver anniversary. Sisters Jennifer Brown and Elizabeth Everson, both Chilton natives, now living in Colorado and Maryland, respectively, will sing with the Alumnae Choir. Local women also will be part of the celebration. Fox Valley resident Sarah Felhofer sang with the program more than 12 years ago. 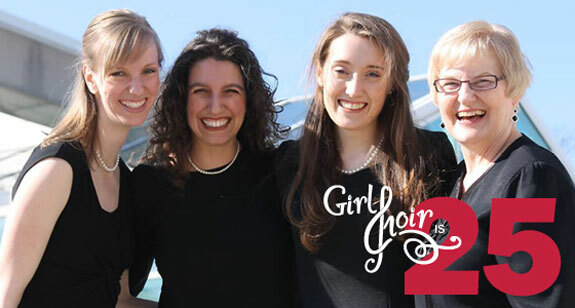 Allison Shinnick (left) and Claire Powling (third from left) will be among the singers performing with the Alumnae Choir for the Girl Choir’s 25th anniversary concert, which was organized by Karen Bruno (second from left), director of the Lawrence Academy of Music and conductor of the Bel Canto choir, and Cheryl Meyer, conductor of the Allegretto choir. Nearly 1,800 singers have participated in the program during its 25 years. There have been 15 teacher-conductors, 36 collaborative pianists and 54 choir managers, many of whom were Lawrence Conservatory of Music education students. Each will be listed in the Girl Choir History pages of the concert program. 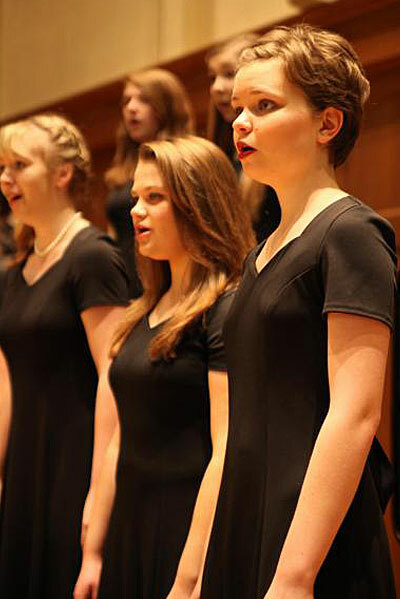 In addition to its semiannual concerts, Girl Choirs have been selected to perform at Carnegie Hall four times, represented Wisconsin at the 400th anniversary of the Jamestown colony, sang for state and regional music education conventions and performed in several international children’s choir festivals and women’s choir festivals. They have collaborated with local arts organizations such as the Fox Valley Symphony, newVoices, Mile of Music, Makaroff Youth Ballet, Fox Cities Performing Arts Center, Appleton Boychoir and Monteverdi Master Chorale, and have a performance permanently linked on Wisconsin Public Television’s website. In 2012, Bel Canto won second place in the nation within the youth and high school choral division of The American Prize competition. More than 300 girls typically are enrolled in the Girl Choir program, representing more than 50 schools throughout Northeast Wisconsin. Current teacher-conductors are Patty Merrifield, Karrie Been, Cheryl Meyer, Toni Weijola, Jaclyn Kottman, Debbie Lind and Karen Bruno. The Lawrence Academy of Music Girl Choir program provides quality choral opportunities for girls in the Fox Valley region. Through the study and performance of the highest quality music, the girls develop vocal technique, musical skills, creativity, expressive artistry, and an awareness of various cultures. The program encourages girls to respect the uniqueness of others, to take risks that foster individual growth and to continue their development into self-assured young women.